I bought a family subscription to share passwords with my wife and my 89 year old parents. The upgrade on my mac notebook and my wife's iMac went perfectly. When I worked on my Dad's iMac I never got the prompt to add a vault (his existing 1Passwords) to the new 1Password 7 online family account. But strangely, when getting things up to date on my Dad's iPhone it somehow found the old passwords and included them. So my Dad's private account under the new family subscription has all his passwords accessible on his phone but they do not show up on his iMac. Any suggestions? Are you sure the data is in the correct vault? It will only sync between devices if it is in his 1Password membership vault. That would be called "Private" not "Primary. I'm having the same issue except i upgraded from version 6 to 7 and now can't get to my passwords. Said i had to convert the vault and now the vault is empty. i don't have a login account but bought 1password outright. Never had a problem with upgrades before. @Mikisunshine - I'm sorry for the trouble! When you converted to 1Password 7 for Mac, did you perhaps set up a 1password.com account inadvertently? If you look in 1Password for Mac at Preferences > Vaults, what do you see? How many vaults do you have there, and what are their names? I only have one vault named Primary. When I upgraded to 7, it rewrote the keychain I use in Dropbox and now there's no passwords in my keychain. I still have them accessible from my iPad and iPhone and MacBook but the iMac is blank. Of course the latter 3 are still running version 6. I haven’t upgraded them yet. @Mikisunshine - OK, thanks. We retired the older style sync keychain used in Dropbox, called Agile Keychain, in 1Password 7 for Mac. 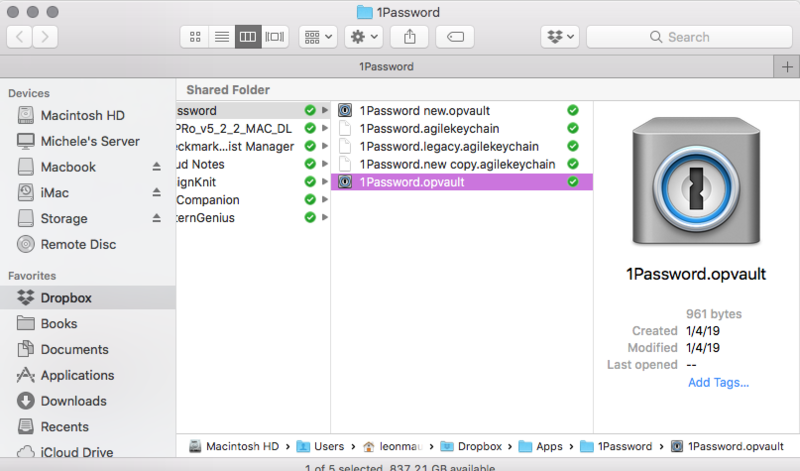 If users had not yet upgraded to the new OPVault format of keychain, we incorporated this movement as part of the upgrade process to 1Password 7 for Mac, since the older style does not work at all. However, what should've happened is that your data in 1Password would be written out to the new OPVault keychain format; it shouldn't be empty. 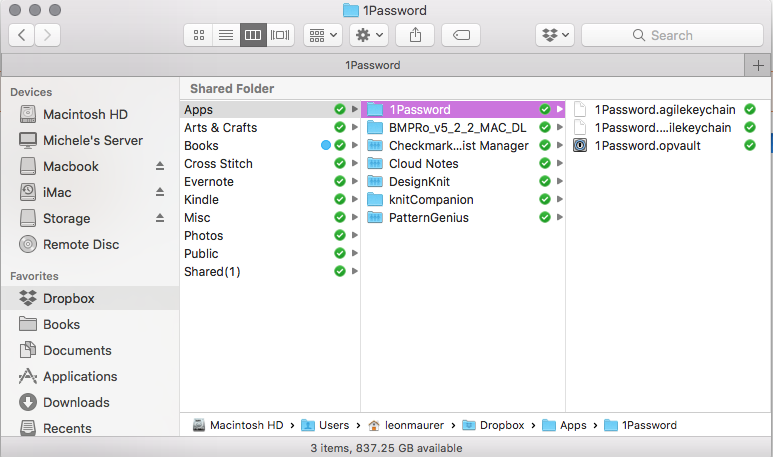 When you open 1Password 7 for Mac now and look at your Primary vault, what do you see if you set it to "All Items?" Is your data there? There is absolutely no data in the vault. It’s empty. This should give you a Finder window that will allow you to navigate to your Dropbox folder and select your Agile Keychain, and import it. Let me know how that works for you. Import is grayed out and I also don’t seem to have my license either. It’s in 6 but not 7. Just be sure not to post anything sensitive, as this is a public forum. Thanks in advance! 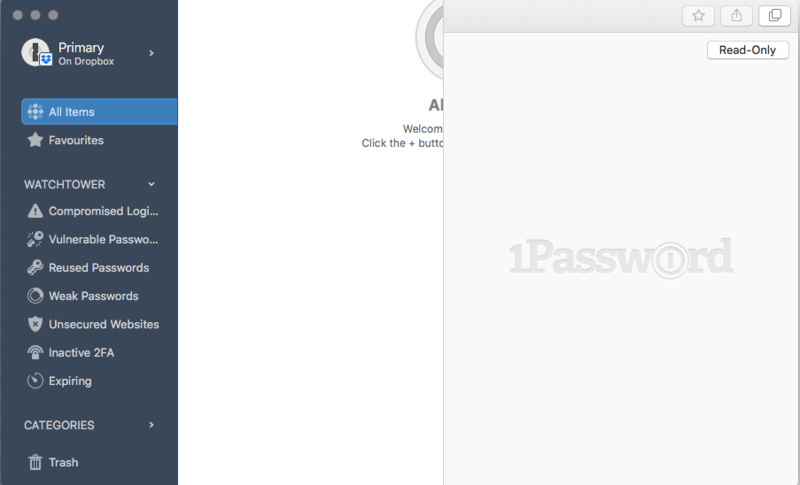 I am attaching a screenshot of the opening screen of 1Password 7. Here's whats in my Dropbox. @Mikisunshine - thanks. What happens if you click 1Password's Preferences > Sync and choose the OPVault file in your Dropbox? Or is that the one that's already selected? i'm having this same problem. import grayed out. chose OPvault when installing version 7, all my passwords are gone. I can't believe I have lost all passwords from year 2011. Please help! What specific version of 1Password you have installed? What specific version of macOS you're using? If you were upgrading, from what previous version, and what specific steps did you take? What's not working the way you expect currently? Anything else you think might be relevant or help us find what might be going on. OPVault is the only choice I have and it contains 0 passwords and info. I’m grateful I still have 6 on my iPad and iPhone but now my iMac doesn’t have access to the passcodes. Is there a way to reinstall 6? @Mikisunshine - I have an idea that I think will work better for you than reverting to a legacy version. Can you tell me, on your iOS devices, if you look in 1Password's Settings > Sync, what is listed for your vault? What file path in Dropbox? Make sure the Dropbox app is installed and running on your Mac. 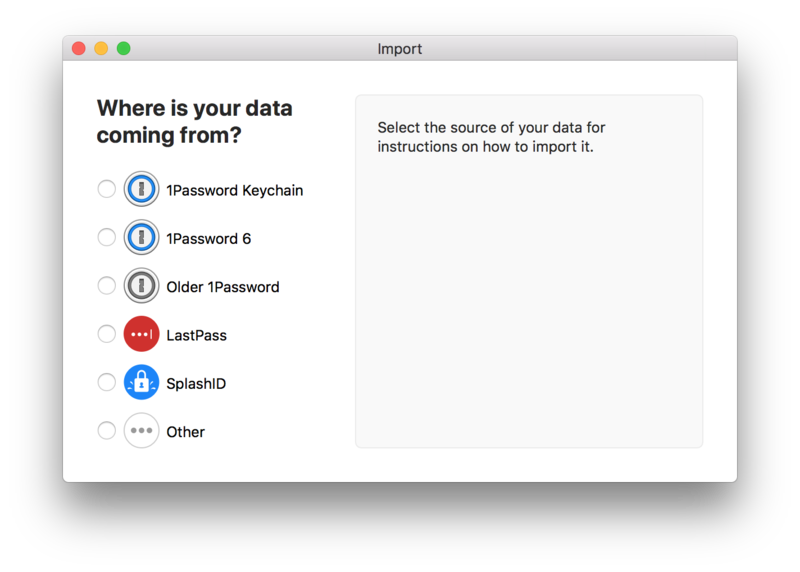 In 1Password 7 for Mac, click Help > Troubleshooting > Reset all 1Password Data. This will delete any current data and quit 1Password. 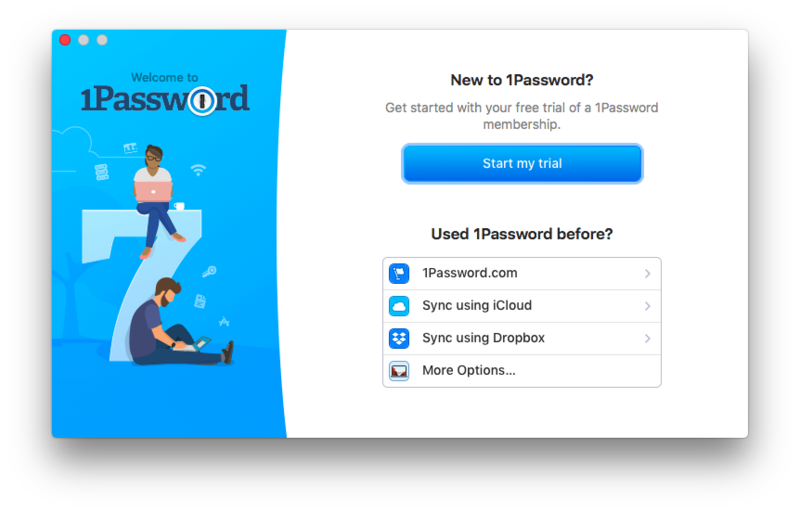 When you restart, it will be as if you're a brand new user of 1Password 7 for Mac. ...then make certain you're choosing the same OPVault - at /Dropbox/Apps/1Password/1Password.opvault that you are using on your phone. Give everything a few minutes to sync, and see what the result is. Let me know how that works for you! There's was nothing in the OPvault now there's 2, 3 or 4 passwords but not the multitude and info i had before. I also have too many agile keychains that are driving me nuts. The largest one which i assume holds my passwords is 1Password.new.agilekeychain with 30MB. The others have less than a couple hundred bytes! Also, now my iPad 1Password6 can't find the agilekeychain. I forgot I wanted to post another screen capture of the dropbox folder. @Mikisunshine - OK. At this point, to get a better handle on what might be where in your 1Password "ecosystem,"
I'd like to ask you to create some diagnostics reports, one from each of your devices. This will link your diagnostics to our current discussion. I'll take a look and let you know what I find out. For anyone else reading, please note: this ID is for @Mikisunshine only. If you’re experiencing the same issue and need help, please ask us for your own ID. I sent the iOS report. I tried to get a diagnostic report on my Mac but had a problem. To reiterate, I removed 1Password 7 and reinstalled 1Password 6. Now its not accepting my license. When I went to do the report, 1Password got hung up and stopped responding necessitating a force quit. I removed 1Password 7 because I couldn’t get to my passwords on Dropbox and because I recently found out you went to strictly subscription. I don’t need those bells and whistles so don’t want to upgrade. I'm going to run Disk Utility and see if that helps anything. If it does, I’ll send it to you. @Mikisunshine: Great! We'll take a look. Can you tell me what happened? Did you receive an error? I may be able to suggest something. The 1Password app hanging up is bad, of course, but it shouldn't prevent the troubleshooting app from generating a report. Restarting your Mac might help though. Sounds good. Let us know how it goes! Hmmm. Here's what I did. Ran Disc Utility and everything came out smooth. The program said "Your 1Password trial has expired!" I tried re-entering my licenses, no go, rebooted and tried this several times to make sure I got all the numbers and letters correct. Finally said Not Now and Ran Diagnostics Report. I got nothing. Once again the app went into the endless circle and not responding necessitating a forced quit. I sent the report to Apple but we all know how that's gonna go. Also, another Team Member said that we could no longer purchase standalone program which means cloud based and subscription only. Doesn't it? I purchased 1Password years ago and I'm perfectly willing to pay for an upgrade but not if I have to go subscription. Still, I'd like to get 6 working again. Adding when I went to reinstall the 1Password 6 Safari extension, it reloaded 1Password 7 which is still sans my passwords. That will connect it to the existing conversation, and we'll continue there to avoid confusing back and forth. Thanks! We can't do anything about macOS crashes, as those go to Apple. But if you get a crash from 1Password, the next time you open it you'll be prompted to send it to us. Also, another Team Member said that we could no longer purchase standalone program which means cloud based and subscription only. Doesn't it? I'm sorry. You misunderstood. Licenses are available from our website, as I mentioned already. I purchased 1Password years ago and I'm perfectly willing to pay for an upgrade but not if I have to go subscription. Still, I'd like to get 6 working again. I think we'll all be happy if we can figure out what's going wrong for you there and get you back up and running with 1Password, period. Looking forward to seeing the diagnostics!